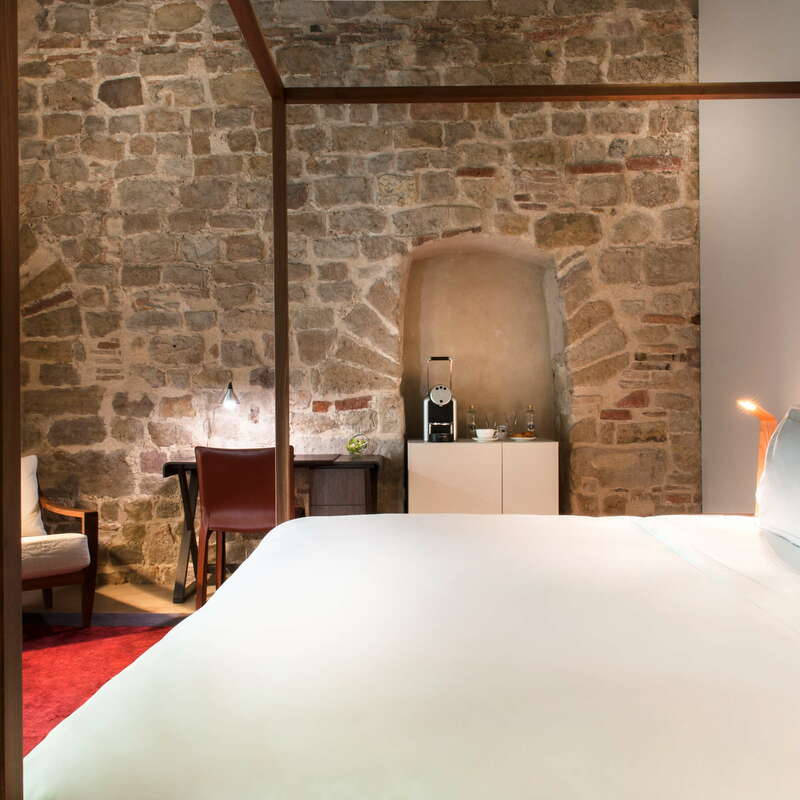 A truly one-of-a-kind hotel, many aspects of this magnificent boutique date to the 1st Century and were once part of the Roman wall that encircled the city. 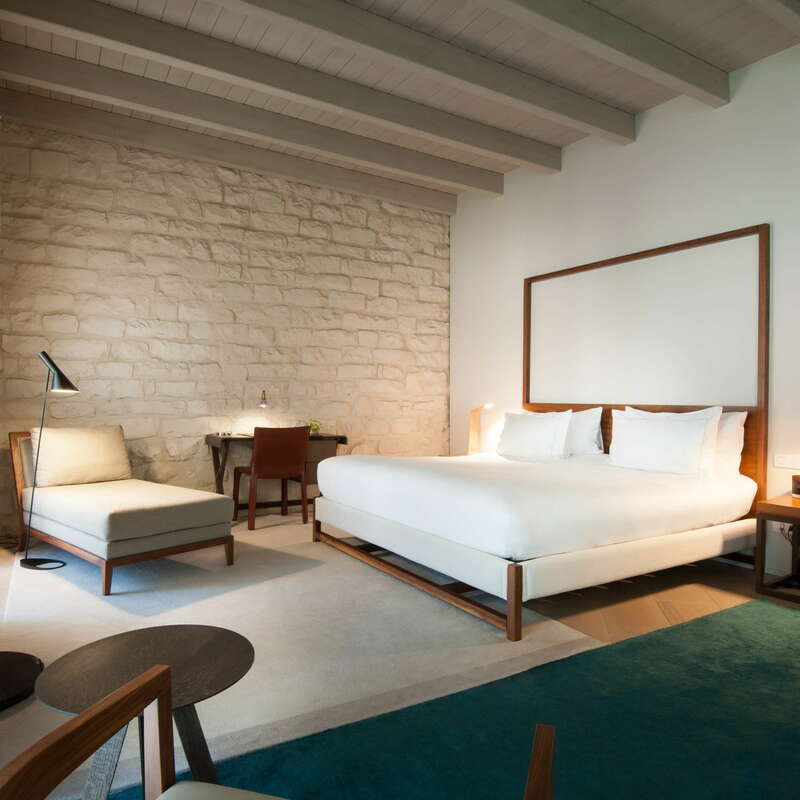 Opened in 2012 as a hotel, the owners along with renowned architect Rafael Moneo went through painstaking work to build around the original arches, ancient facades, and centuries-old wood beam ceilings. 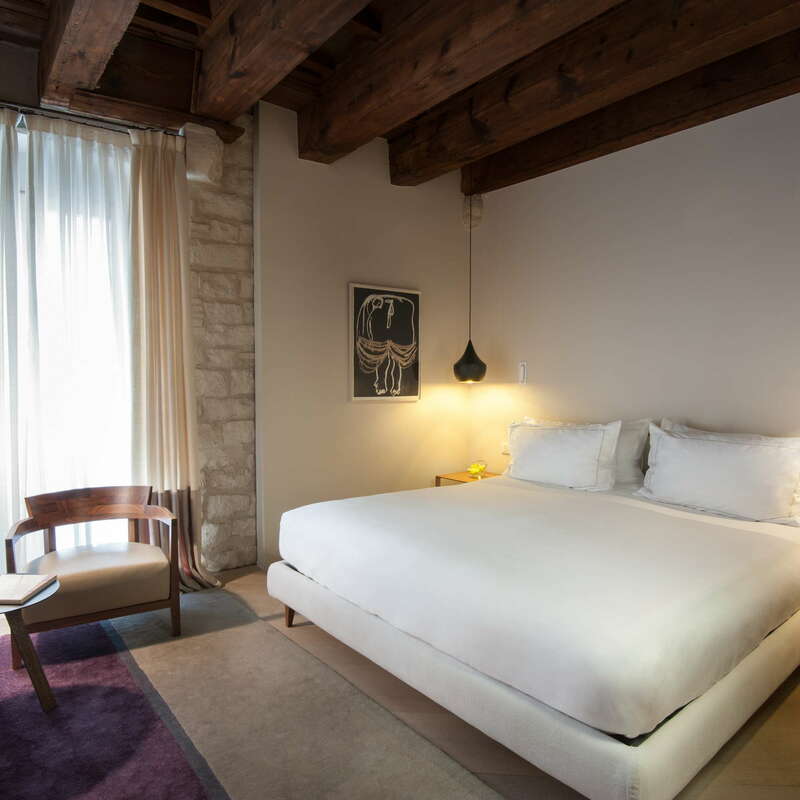 Nestled in the windy and charming Gothic Quarter, this five-star standout is a must for high-end history lovers who also like a good bit of pampering with their hotel stays. 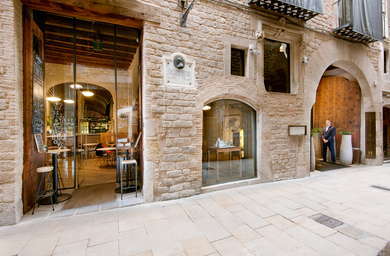 YOU SHOULD KNOW Because the hotel is located in the winding alleys of the Gothic Quarter, direct taxi access is very limited. 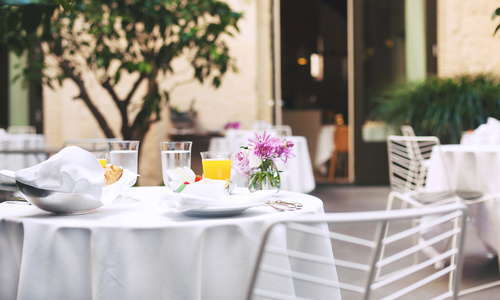 You should let the hotel know when you’re coming so you can either book their direct car service, or have someone meet you in Plaça de Sant Jaume nearby. 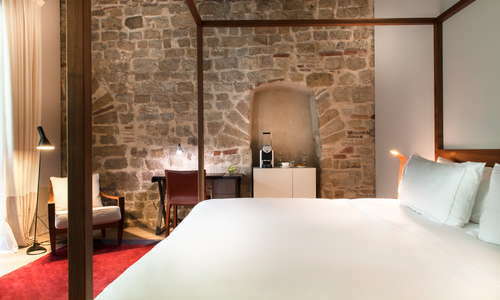 Depending on which of the 28-rooms you stay in, you’ll find different sizes, shapes, and styles – many incorporating the 1st Century walls of the complex. Inner rooms are treated to courtyard views and have overhanging balconies looking down on orange trees while others look on a four-story vertical living wall. 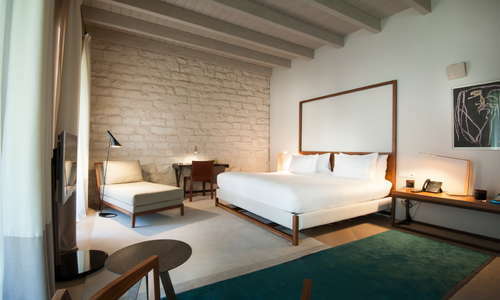 All rooms have light wood floors, a mix of modern art on the walls, simple design, and modern amenities including Nespresso machines and touch-sensitive lamps. 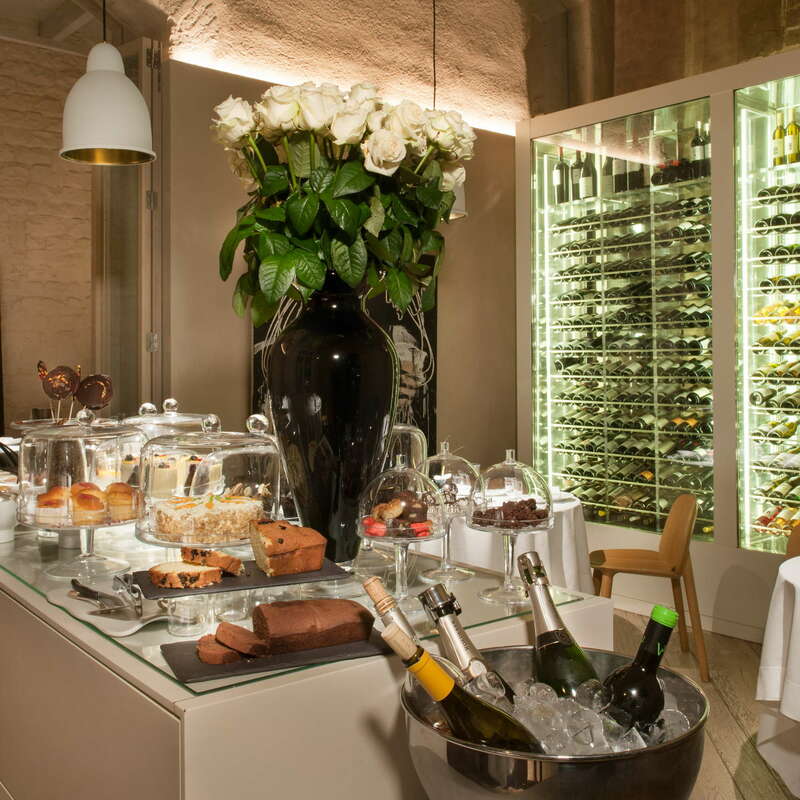 The mini-bar is complimentary and replenished daily – so go to town! 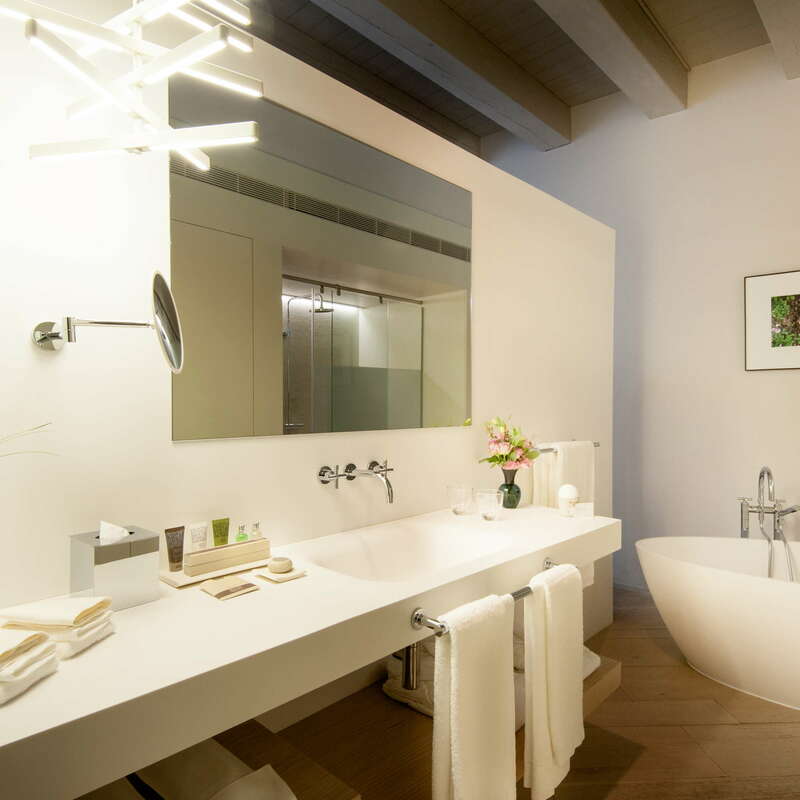 The bathrooms are spacious with long white counter tops, mobile-designed hanging lamps, and Molton Brown products. Showers are replete with mini white mosaic tiles and white wooden floorboards. 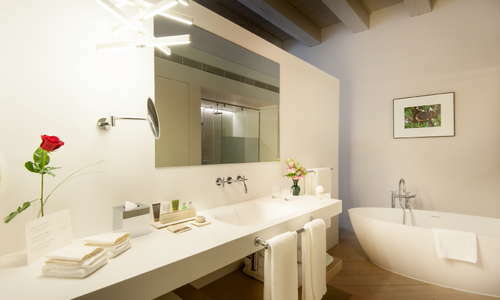 Some rooms come with standalone bathtubs as well. If you book a junior suite deluxe or suite, the added benefits are really great. 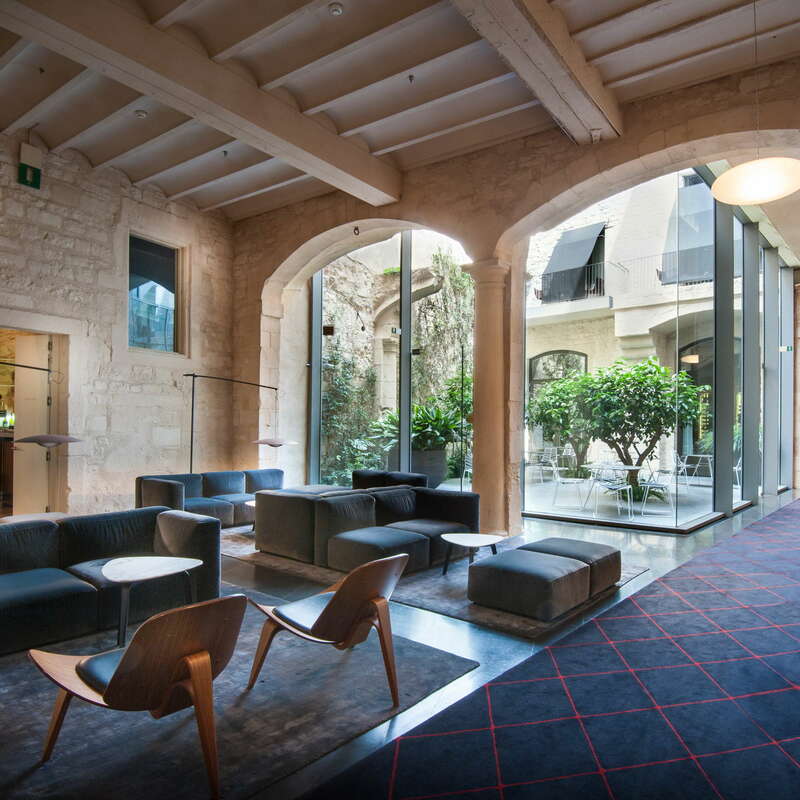 They include a free airport transfer, welcome gift, tasting of tapas at the restaurant, and even a 1-hour guided tour of the Gothic Quarter. 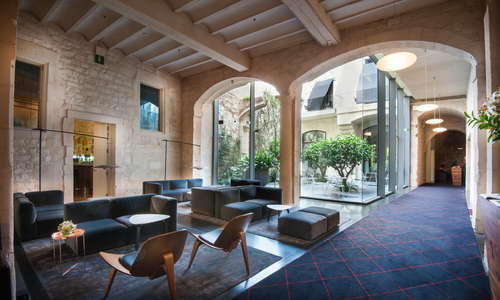 As you cross under the ancient stone arches, you’ll enter a warm and friendly spot with runner carpets, cushy couches, and a stunning glassed in patio providing odes of natural light. Off to one side is the hotel’s tapas bar while in the back is the main cocktail bar, restaurant, and inner library with a computer terminal for printing out boarding passes. 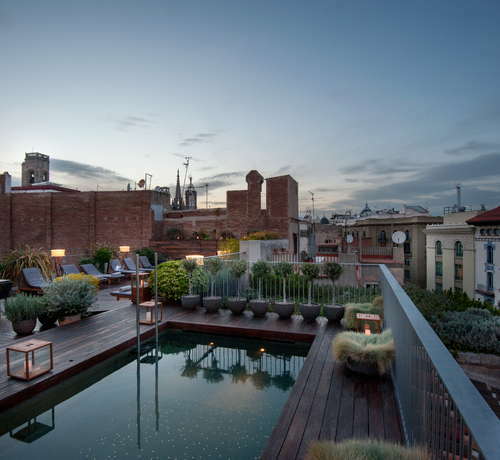 If you head up to the 4th-floor roof, you’ll discover a small rectangular pool that looks down on the Gothic Quarter below. Surrounded by wood slats and umbrella-covered loungers, the pool area is a summer-time hang that opens a bar between May and October (weather pending). There’s no dedicated spa, but guests can order from an in-room menu that features massages, skin treatments, facials, and more. If you’re jones’n for a workout, you won’t find anything at this hotel, however they partner with a gym nearby that you can use for 20 Euros. 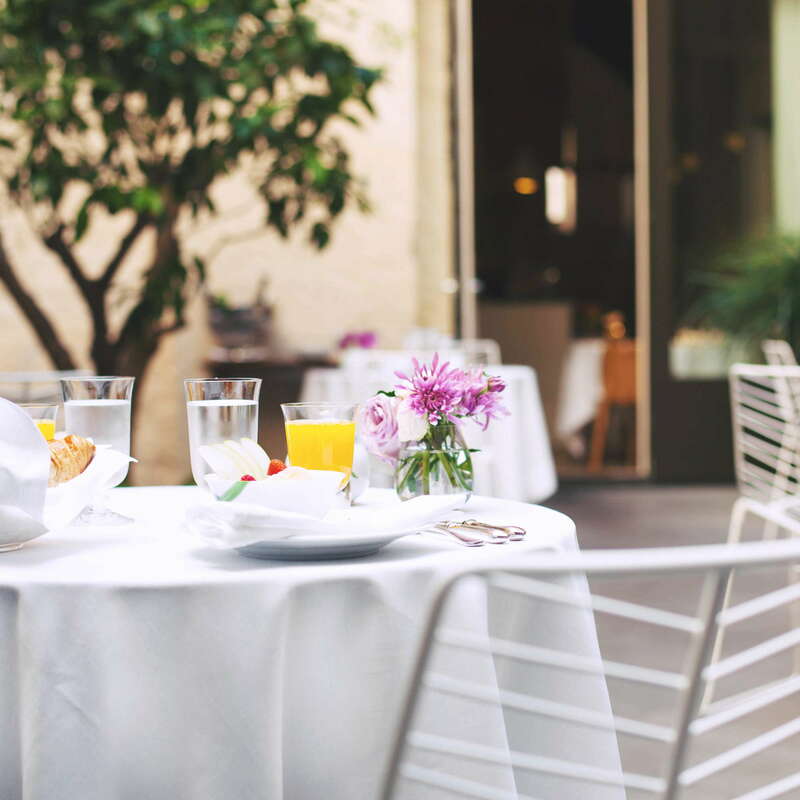 There are multiple dining outlets here and the main restaurant is simply dubbed The Mercer and features Catalan cuisine under original stone arches and refurbished frescoes. 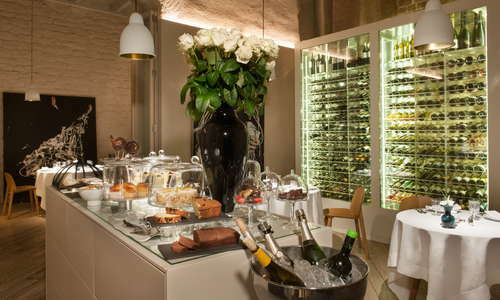 Le Bouchon, meanwhile, is the hotel’s tapas bar and bistro with a great menu of finger foods and wine options. At the back of the lobby is the cocktail lounge where expert mixologists sling signature and classic cocktails against the ancient backdrop of the hotel. The Gothic Quarter is one of the most unique parts of the city and its easy to get lost (in a good way) among its maze of alleys and hidden squares. If you want to get further away, there are always taxis parading the nearby plaças and major thoroughfares and the closest metro stop is at Jaume I, only about 5-minutes away. For one of the best seafood meals of your life, head over to Estimar (5-minute walk) where the family who runs the business has been in the fish trade for more than 100 years. If you just want great tapas in a fun environment, check out Cal Pep (7-minute walk) instead. Cocktail fans will find plenty to love if they head over to Paradiso (8-minute walk), a funky spot with some of the best drinks and tapas in town. Another classic spot is El Xampanyet (7-minute walk), a cocktail joint that’s been in business since 1929 and famous for its incredible cava. 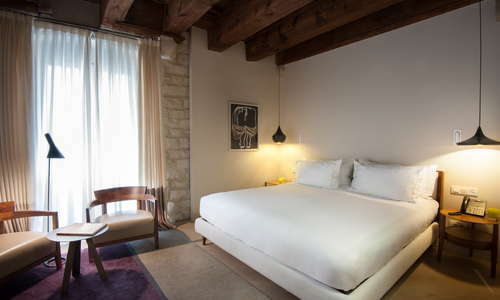 This hotel lives up to its five-star reputation with a generous and attentive staff, an acute attention to detail, and a spectacular building with more than 2000 years of history. The charming spot fits right in amongst the windy confines of the Gothic Quarter, adding to its unique history with its very own heritage. Inside, there are very solid drinking and eating options, along with a great bar, and beautiful rooftop. If there’s any drawback, it’s that there’s no spa or gym (though they give you alternatives if you need them) and direct access to the hotel is limited via car. Beyond that, this exceptional joint is a one-of-a-kind find that’s worth its high price point.